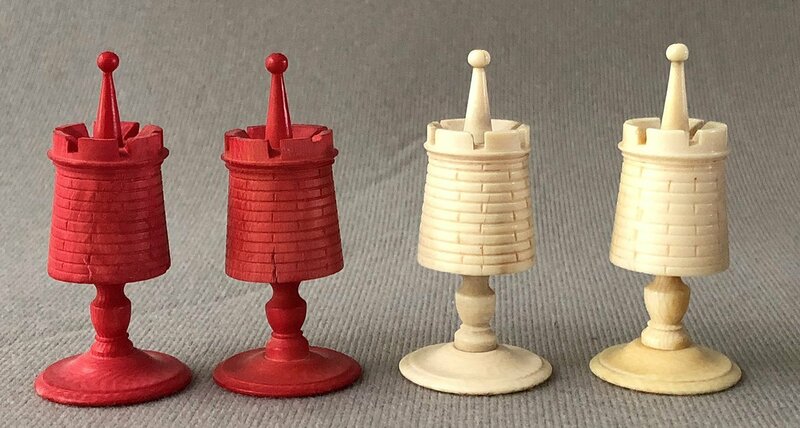 Later Antique Washington Style Chessmen. This offering is an example of a later set of Antique Washington Style Chessmen. The chess pieces are natural and red-stained. The King stands 3-3/8″ tall with a 1.3″ diameter base. The Royal chessmen are similar to the Barleycorn in design. The Kings and Queens feature full, slightly tapered barrel bodies mounted atop urn-shaped pedestals. The Rooks are pedestal-mounted rusticated towers with staffs. The Bishops and Pawns have self-similar Urn-like pedestals. 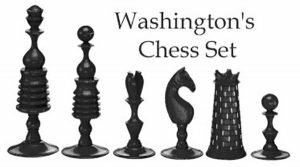 These Antique Washington Style Chessmen are the style as you would see on sets made during the early part of the 19th century and are often referred to “Washington” style chess pieces due to their resemblance to chessmen used by George Washington (See image ). These are authentic antique chessmen that will make a fine display. 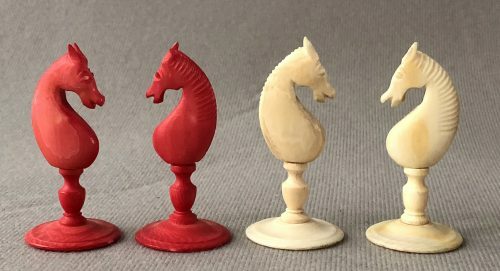 Except for the occasional age-related hairline fissure, these circa 1820 chess pieces are in excellent condition. 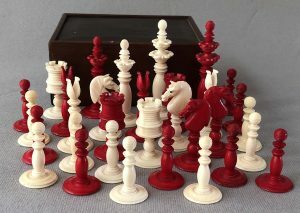 The red stain is still vibrant and the natural chessmen have a very pleasant “antique” patina. 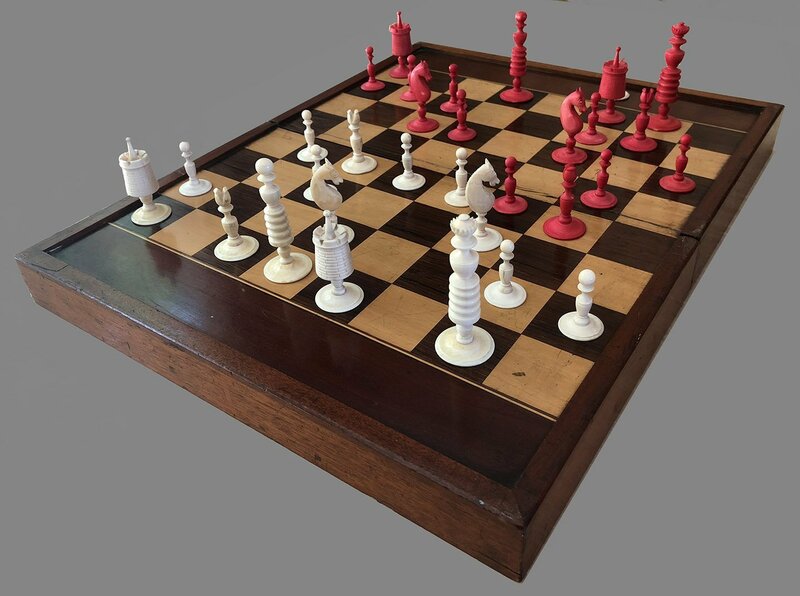 These fine antique chessmen play and display best on a chessboard with 1-3/4″ or 1-7/8″ squares. The early Victorian Period folding chessboard shown is not included. The chessmen are housed in a replacement wooden box, not shown. 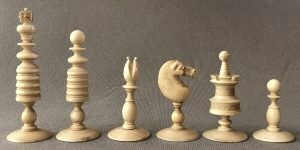 For a suitable chessboard, please visit our fine on-line chessboard selection. 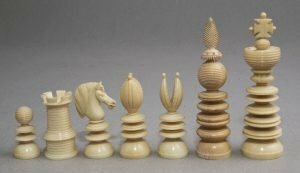 The term Barleycorn, when applied to chessmen, is widely used for a range of English Playing chess sets made primarily, but not uniquely, in England during the 19th and early 20th centuries. 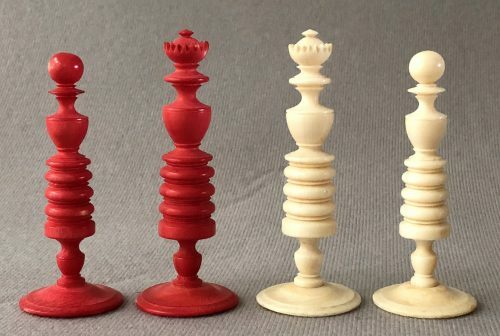 This ubiquitous chess set design is supposedly derived from the shape of foliate decorations on the Kings and Queens. Many Barleycorn sets have decorations resembling the leaves of barley or other similar embellishments. However, many more lack these decorative embellishments, but still retain the Barleycorn moniker. 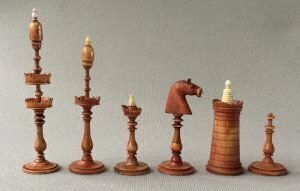 Barleycorn pattern Chess Sets first appeared at the beginning of the 19th century and were in common use through the early 20th Century.